Costco Weekly Ad Savings. 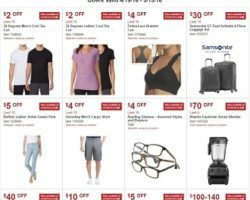 Get the Costco Ad sale prices, current coupons, this week best deals & sales, promotions and offers. As one of the country’s biggest membership-only retailers, Costco offers one of the most varied selections of bulk buys on the market and some of the best prices for foods and general merchandise as well. The warehouse club has various departments, from computers and office to sports and fitness, and from grocery, household & pet to clothing and jewellery, all carrying brand name lines as well as private label items. Kirkland Signature is Costco’s very own company brand that has been introducing products to the market for approximately 20 years now. Some Kirkland signature products are ranked just as good as popular brand products. The Kirkland organic range is known for the reasonably priced coconut oil, for example, and for the organic cheese selection. The Costco ad provides further discounts and coupons to the usual low prices and savings, the warehouse typically offering such deals as dollars of select items for both conventional foods as well as organics, and for athletic apparel, electronics, pet items and house appliances among many others. With Costco pizza prices that are under $10 for a whole one, the retailer Food Court offers one of the best pizzas in the United States.